This single origin cacao powder comes to us from Madagascar. Rare and unique cacao is grown in Madagascar, and this cacao contributes to less than 0.1% of the world cacao production. Originally harvested and processed by Planteur Chocolatier, Gran Cru Sambirano Drinking Chocolate is a naturally fruity and non-bitter fine cacao powder. It is freshly pressed from rare cacao grown, fermented and dried in Sanbirano. It is then dried in an organic rainforest plantation. The rare cacao powder used to make this hot chocolate powder is naturally lighter in colour. This particular cacao was brought to Madagascar in 1822. It was first planted in the east coast rainforests. However, this part of Madagascar was often susceptible to cyclones, so, in the early 1900s the cacao was moved and planted in the Sambirano Valley instead. The valley is located in north-west Madagascar and is sheltered by the Tsaratanana mountain. The cacao has since then been moved back to the east coast where it had its first harvest in 2016. 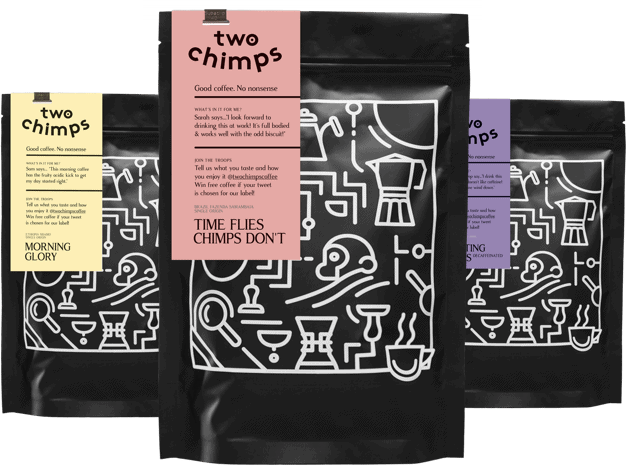 At Two Chimps, we roast coffee. We, therefore, have joined forces with a local chocolatier to bring you this Hot Chocolate Powder. ‘B is for Brownie’, also from Rutland, have blended the above with golden caster sugar and a pinch of salt to make this 53% chocolate powder. Unsure how to make Hot Chocolate at home? Check out our handy guide. Ethically grown and crafted by the Malagasy. One scoop of this excellent chocolate powder, and you’ll be in Hot Chocolate heaven. Just add hot milk and enjoy. Ingredients: Madagascar cocoa powder (53%), golden caster sugar, fine sea salt. Made to a wheat free recipe & made in a kitchen that handles nuts, sesame, wheat, milk. Store in a cool, dry enviroment.